We use this sign in conjunction with periodic campus-wide campaigns to help educate about the need to save accessible parking spaces for customers authorized to use them. They are also placed in key areas in advance of enforcement events where we partner with campus police to target. We send a campus-wide message to the campus community to help raise awareness. We send this notice campus-wide twice per year to help educate about the need to save accessible parking spaces for customers authorized to use them. At times, we send it in advance of enforcement events where we partner with campus police to target enforcement in areas that tend to be more problematic. We also deploy temporary signs moved from area to area to help raise awareness. The Americans with Disabilities Act (ADA) National Network consists of 10 regional ADA Centers and an ADA Knowledge Translation Center. The regional ADA Centers are distributed throughout the United States to provide local assistance and foster implementation of the ADA. Find the ADA Center that serves your State by visiting the ADA website and clicking on the map https://adata.org/find-your-region. This guide explains requirements in the ADA Standards for parking. The ability to safely park at one’s destination is an important component of community participation for people with disabilities. With the proper permit, people with disabilities should be able to use accessible parking spaces in public parking lots. 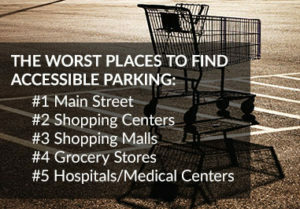 However, a lot of people with disabilities have encountered barriers to parking. This brochure is made possible by a grant from the Dole Institute of Politics, with funding from the General Electric Company.